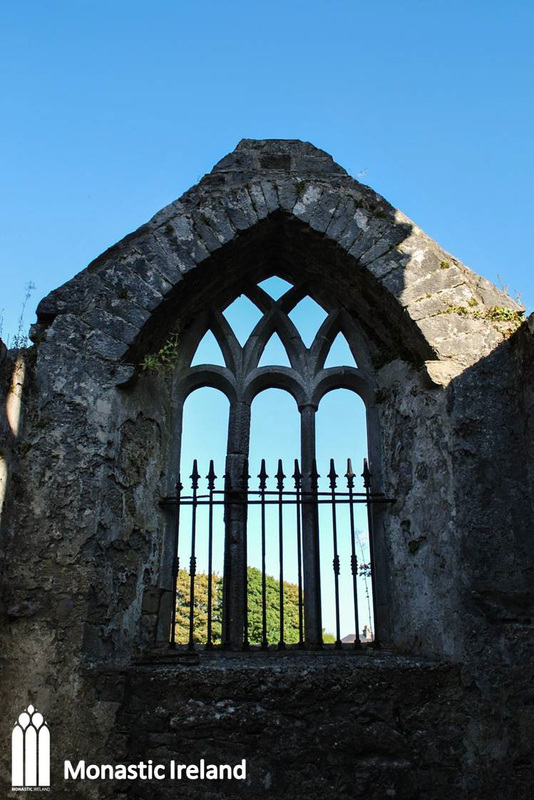 A view of the west gable of the church, with the doorway through which the laity would have entered the nave. 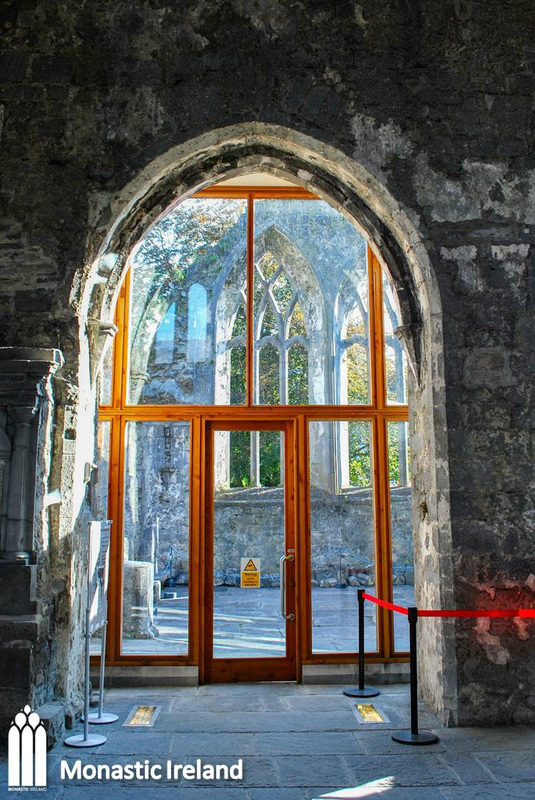 The window is a fifteenth-century triple-light with switch-line tracery typical of mendicant architecture in Ireland at the time, while the doorway is a modern insertion, probably dating to the seventeenth century. 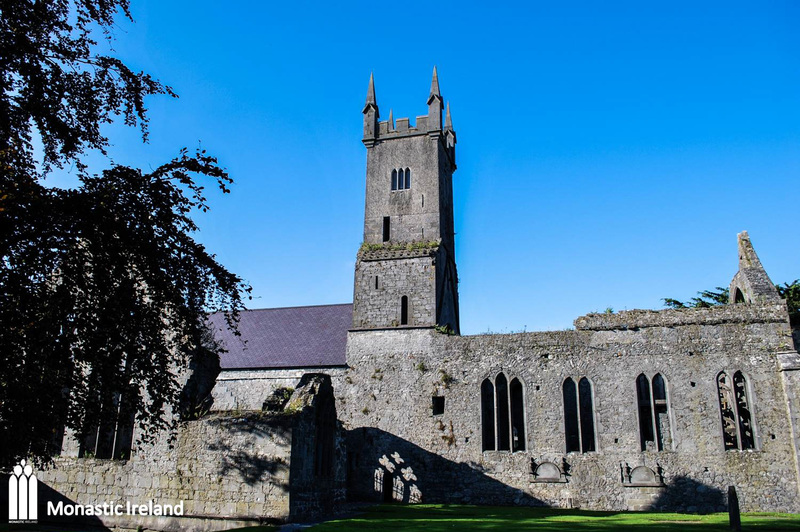 This image shows the length of the friary church, looking down the nave and the chancel through the central tower, before the restoration of the church took place a few years ago. At the end of the nave the large tower arch would have been closed up by a rood screen, surmounted by an image of the Crucifixion (the rood) supported by a beam placed in sockets still visible high in the west wall of the tower. The rood screen was fixed through sockets lower down on the inside of the arch. A view of the nave after the recent restoration campaign, during which the nave was roofed, and glass partitions were added between the nave and transept and the nave and chancel. 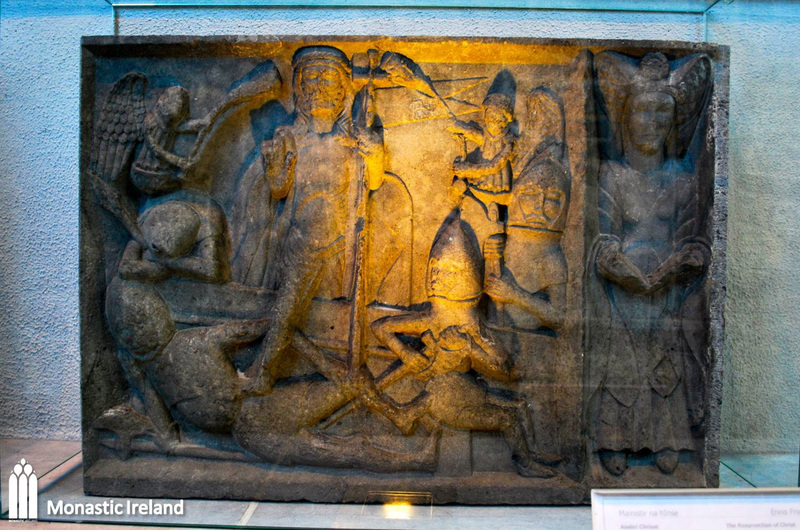 The fifteenth-century MacMahon tomb, reused as part of the Creagh tomb in the late nineteenth century and originally located in the north wall of the chancel, was restored and moved to the nave, where it is now part of a permanent exhibition of each of its sculpted panels and of other fragments of sculpture. A replica of the tomb was made to be placed at its original position in the chancel. This is one of two fifteenth-century wall tombs in the north wall of the nave, the arches of which have been blocked. 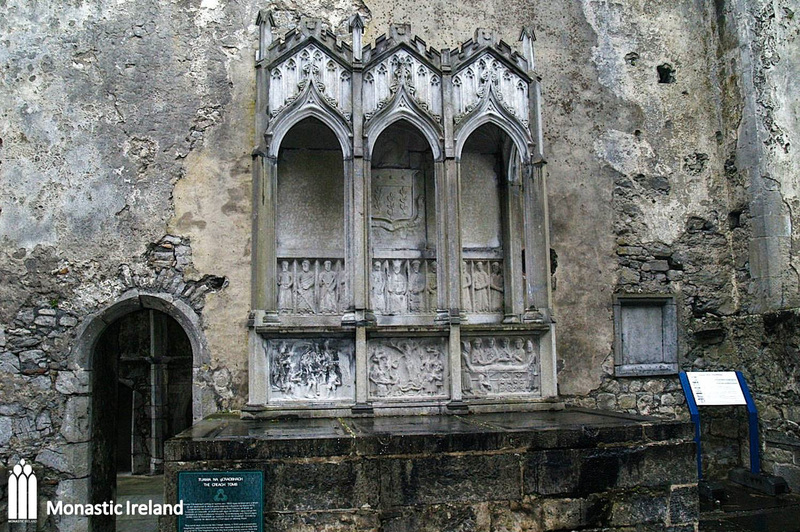 Mendicant churches were a popular option among the wealthier classes when it came to choosing their final resting place, and this type of canopied tombs appear in several friaries of the west of Ireland, including Adare Franciscan and Augustinian friaries, and Askeaton Franciscan friary, all in County Limerick. This fifteenth-century carved panel depicting St Francis showing the stigmata is placed at the east end of the nave, directly to the north of the tower arch, above a side altar which was likely dedicated to St Francis. 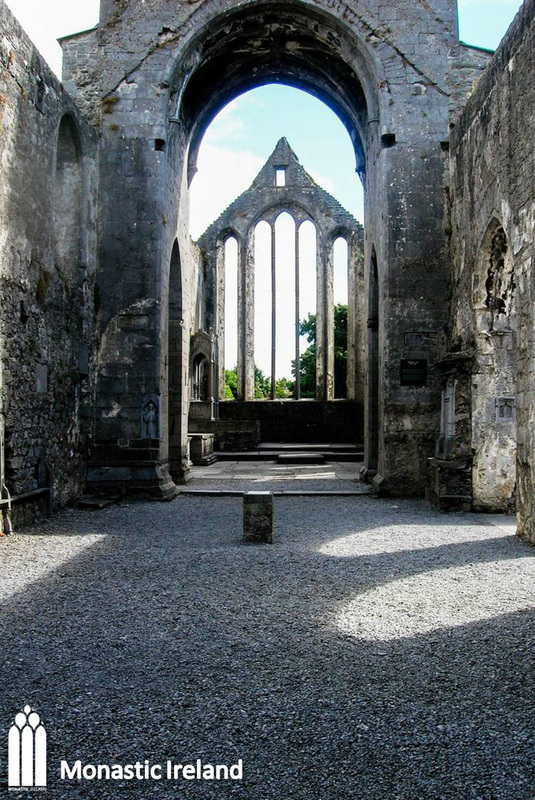 Its position in the nave indicates that it was placed here for the spiritual benefit of the laity. It was indeed a popular devotional image people could pray to, presenting Francis as a direct intercessor or intermediary between the faithful and Christ. A view of the south transept through one of the two arches of the arcade that separated it from the nave. 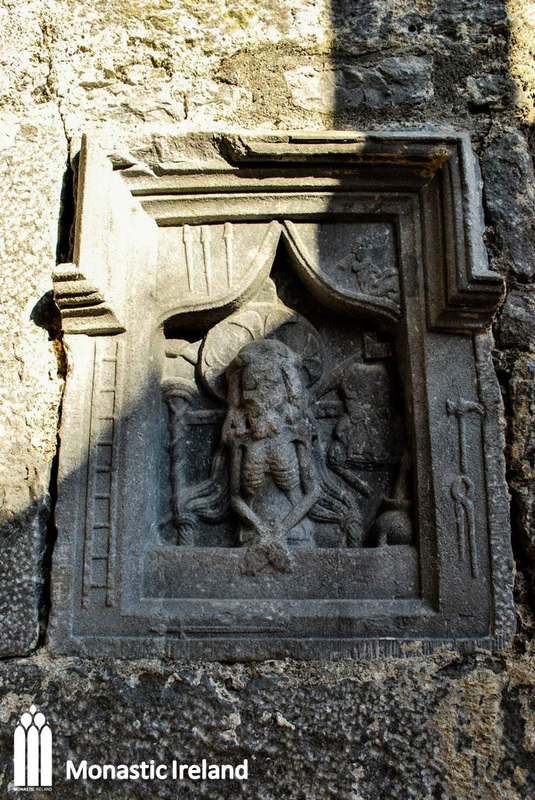 The image of the Man of Sorrows described below is inserted on the inside of the arch to the east. The south transept was added to the church in the fifteenth century. 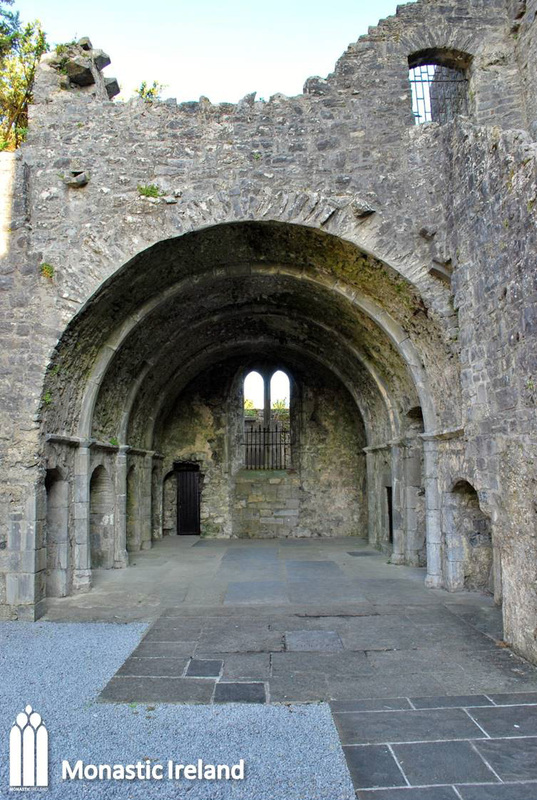 These large funerary and devotional spaces were added to many mendicant churches from the fourteenth century onwards, and in Ennis its construction was probably funded by members of the powerful O’Briens, who were the main benefactors of the friars. The image of St Francis is paired with an image of the Man of Sorrows on the other side of the nave, but this time inserted on the east face of the arch leading into the south transept. Again, its position indicates that it was aimed to be viewed by the laity, for devotional purposes. It is a rare Irish example of a popular iconographic representation of Christ with the wounds of his Passion prominently displayed on his hands and side. Here he appears as a skeletal figure, dead yet alive, surrounded by the Instruments of the Passion. As well as its devotional function, this image would have also served as a reminder to the faithful of the sacred events of the Passion and the Resurrection. 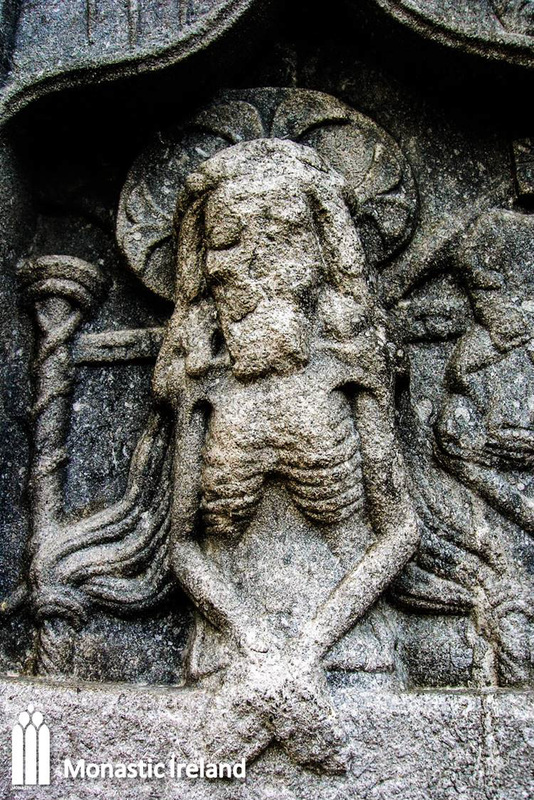 A closer look at the carved image of the Man of Sorrow, representing Christ as a skeletal figure emerging from his tomb. This image as well as the portrait of Francis in the nave, the five panels of the Passion of the MacMahon Tomb and the fragmentary Pieta now exhibited in the restored nave all appear to have been produced by the same workshop, or perhaps even by the same artist, probably between 1460 and 1470. The transept has not one but two large windows in its south gable, which are both triple lights with switch-line tracery, similar in style to the window in the west gable of the nave. They would have made for a particularly bright space, and it is likely that secondary altars serving private chapels would have been accommodated underneath each of them. 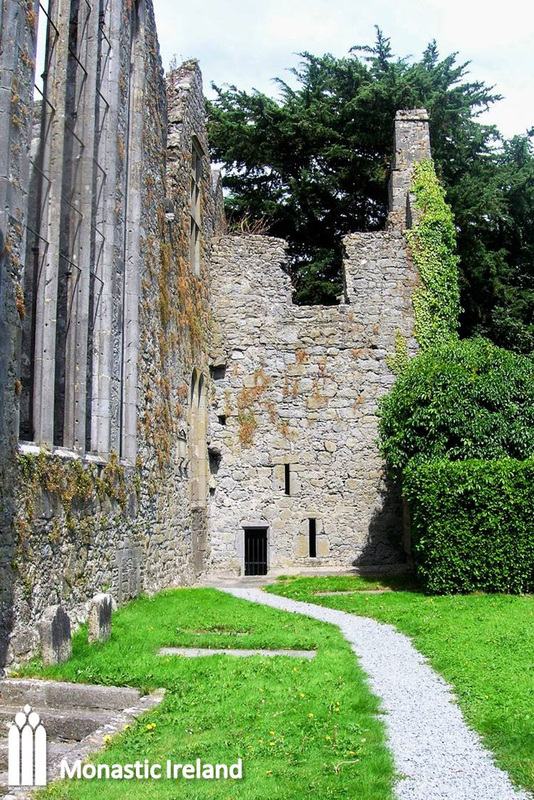 A view of the south transept from the gardens outside of the church, showing how it abuts the nave. 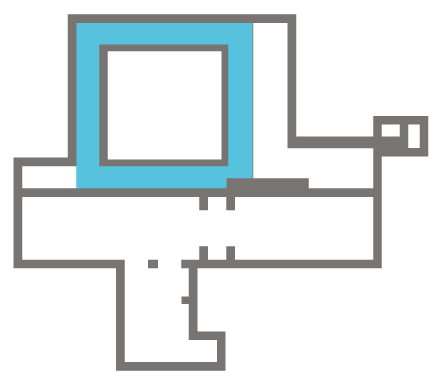 The chapel is a small separate space (usually off the aisle or transept) which contained a secondary altar, often dediecated to a particular saint. They were usually erected by members of a specific family as a private chapel. An external view of the small chapel which projects off the main body of the transept, to the east. 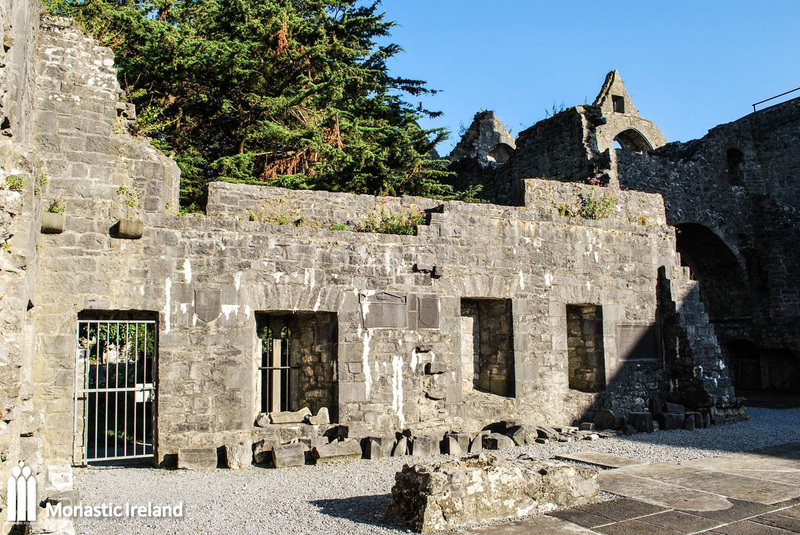 It probably housed a private altar funded by a wealthy benefactor for his spiritual benefit and that of his family, where prayers and masses could be said by the friars for the souls of the deceased, who were likely buried in the chapel. The chapel’s east window is again of the typical fifteenth-century style found elsewhere in the church, a triple light with switch-line tracery. 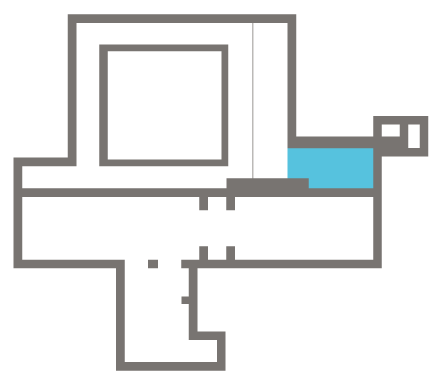 That the chapel housed an altar is confirmed by the presence of this double piscina. The patron or patrons who funded the construction of the chapel also provided donations towards the maintenance of the altar and the payment of masses to be said by one or several friars for their souls once they had passed. It is also likely that they would have secured burial rights for themselves and other members of the family within the space of the chapel. 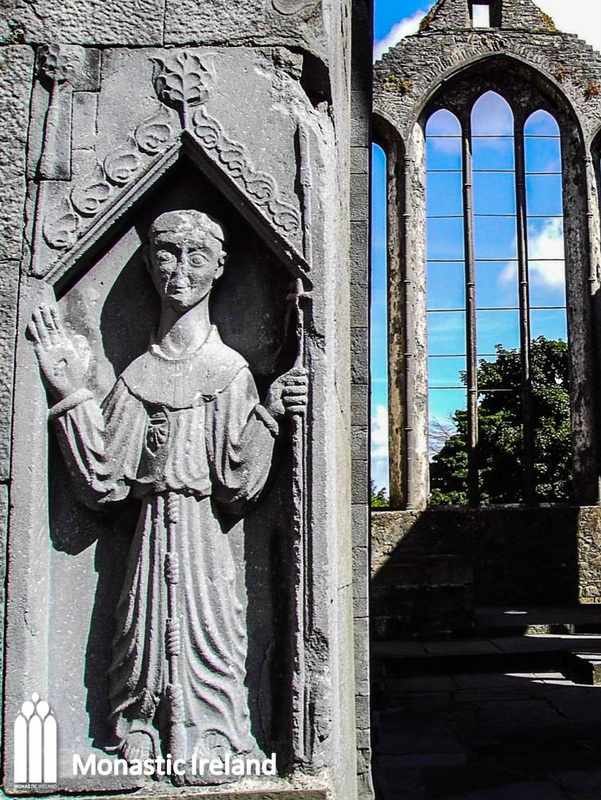 The impressive bell tower of Ennis friary was probably inserted in the fifteenth century and is adorned with numerous attractive sculptures. 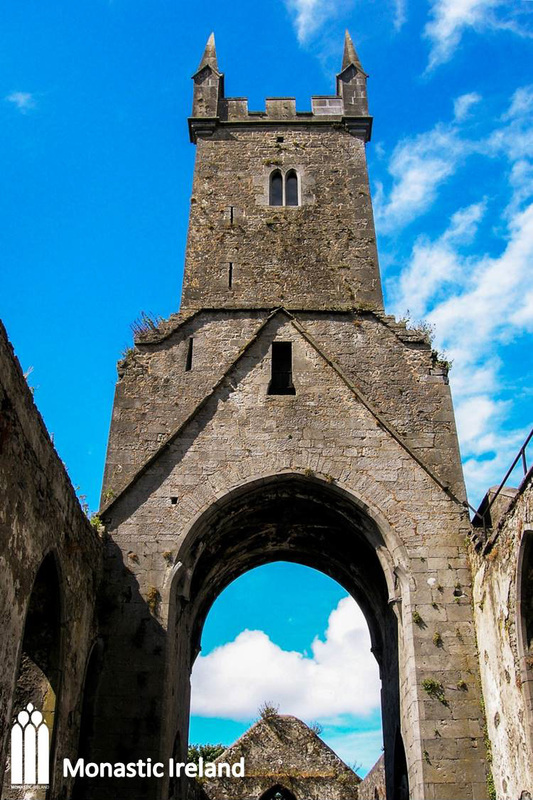 Its arches are amongst the tallest of all surviving mendicant churches, and also among the widest. 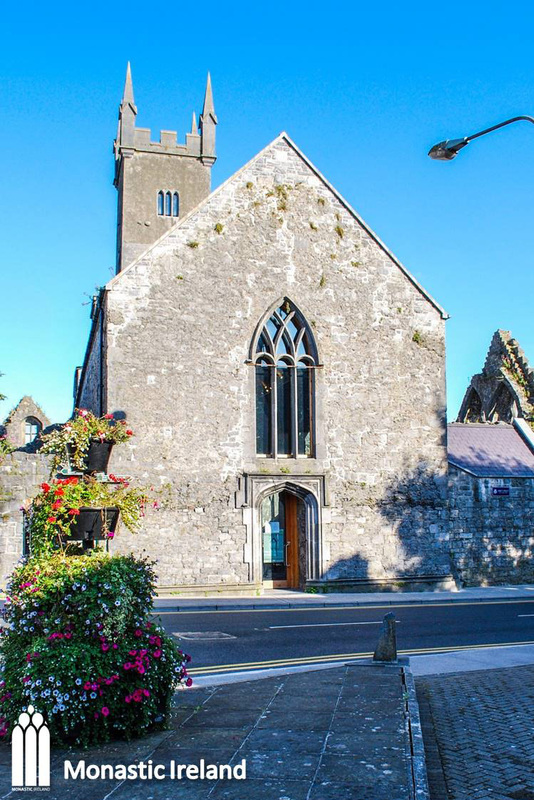 The incongruous pinnacles at the top are an early nineteenth century addition, relating to when the friary was used as a Church of Ireland church. 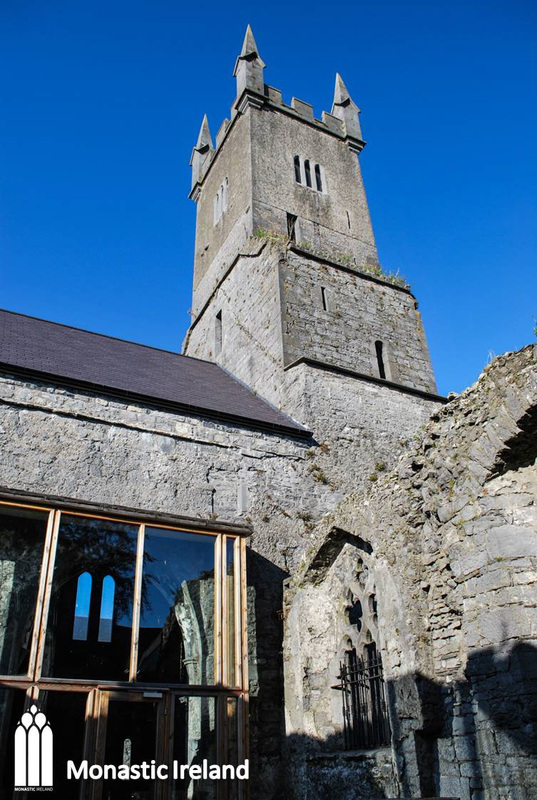 Another view of the tower, taken from inside the south transept. This panel, placed on the north side of the tower arch, originally served as the backdrop (retable) of a minor altar. It depicts the St Francis showing the stigmata, a popular devotional image that paired with the Man of Sorrows on the other side of the arch, compares Francis with Christ. This corbel forms another one of the supports of the central tower. Images of bishops, abbots and archbishops in this location are often intended to depict the prelate who presided over building works. 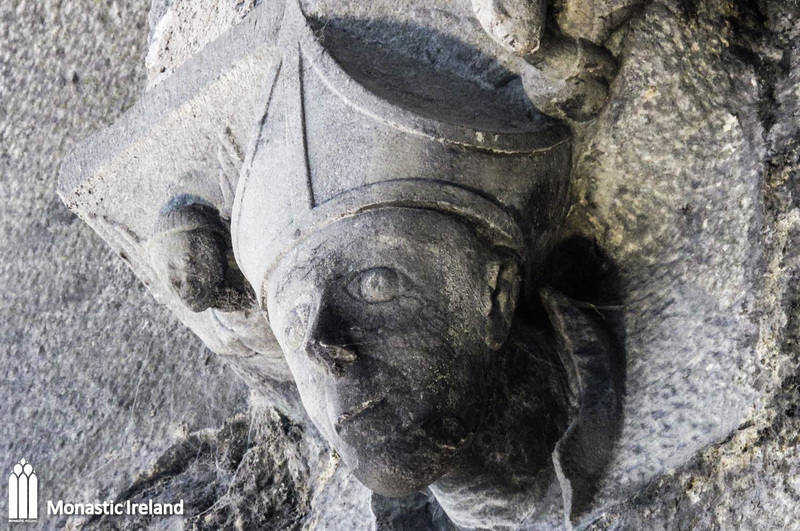 The presence of flanking angels suggests that the individual in question was deceased at the time of carving. This corbel forms another one of the supports of the central tower. Secular ’portraits’ in this position are sometimes intended to commemorate donors literally ‘supporting’ the church. 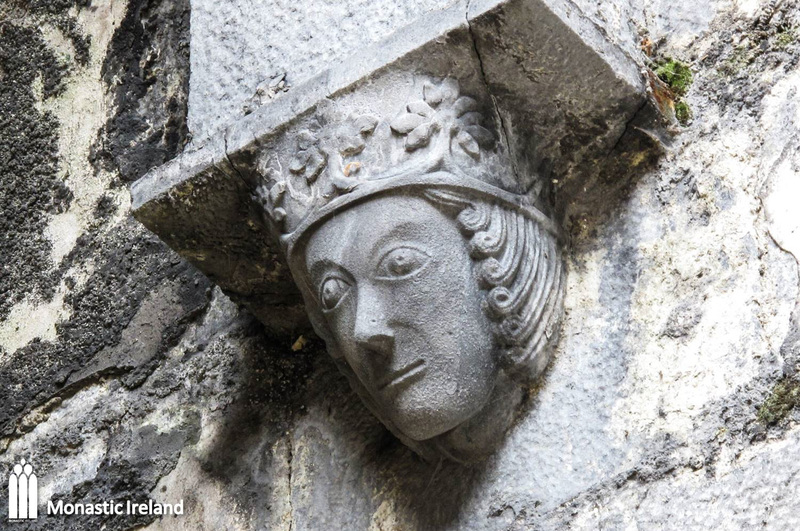 In this case the crowned figure may represent one of the O’Brien family, who were major patrons of the friary. This corbel forms one of the supports of the central tower. 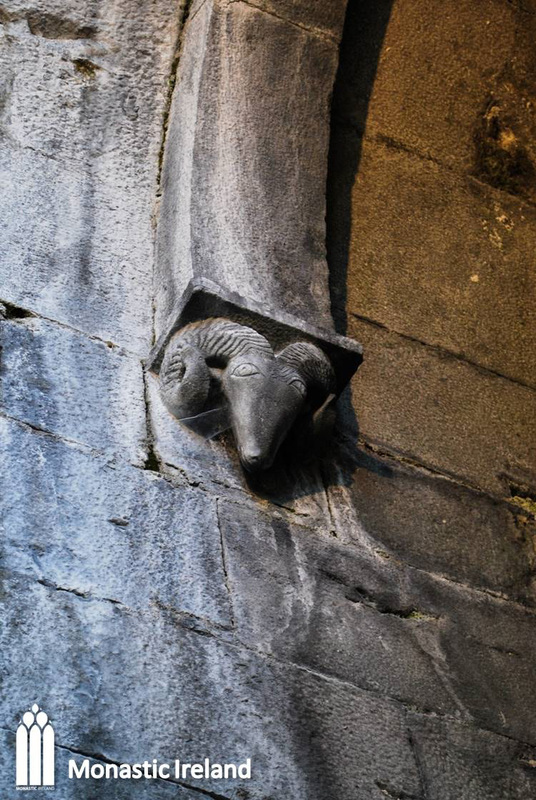 The ram’s head was a relatively popular motif in late medieval art. It was sometimes equated with Christ, both as the leader of the herd, but also through association with the ram sacrificed by Abraham in place of his son, Isaac. 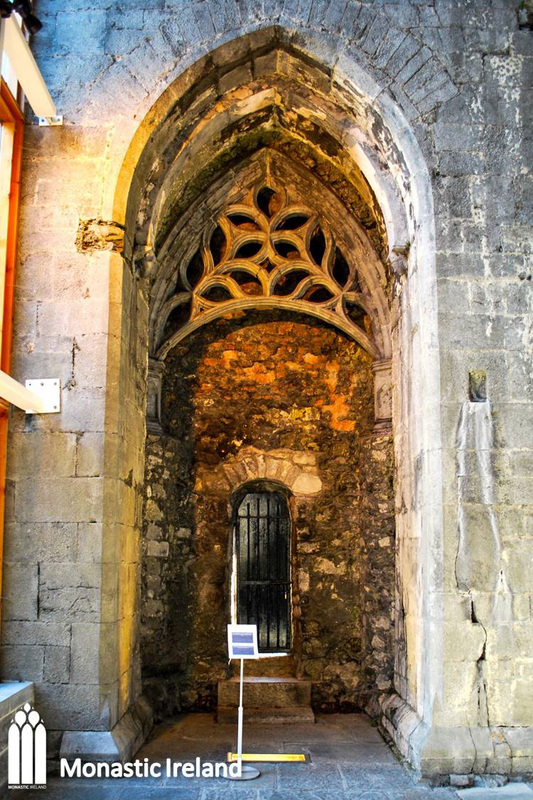 This unusual tracery screen is located under the tower, to the south. It most likely served to draw attention to a minor altar or tomb beneath. The arch of the screen rests on either side on a carved panel, with the figure of a bishop on the east-most panel and a Virgin and child on the west-most one. 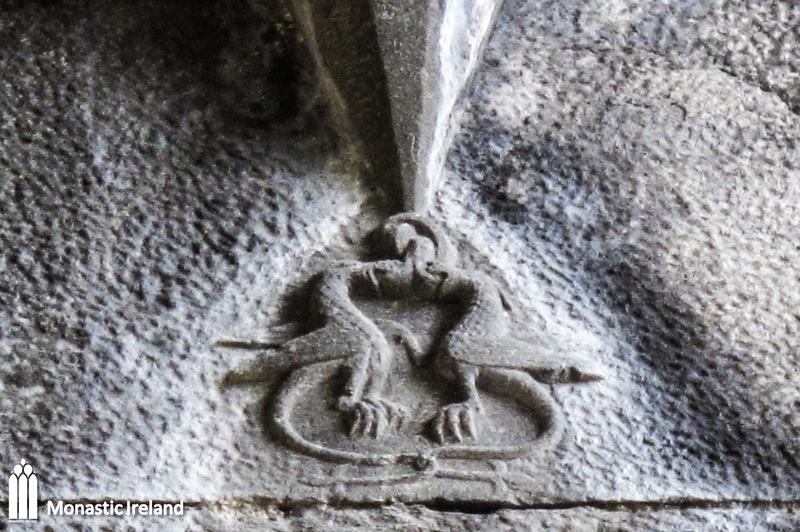 These playful mythical beasts, their tails intertwined, are placed high up at the springing of the tower vault. Their meaning, if any is intended, is unclear. 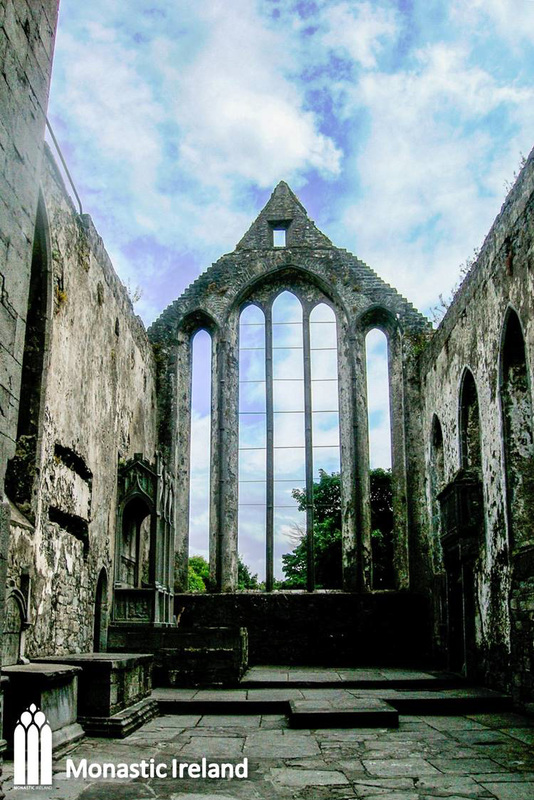 The great east window of the friary was one of the few that the friars were permitted to fill with painted glass. 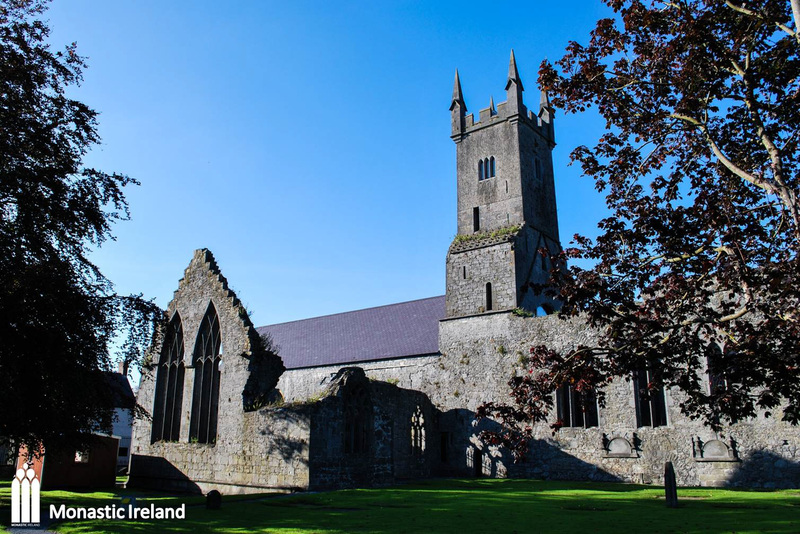 A fourteenth-century poem describes the blue glass that lit the interior of the church. A view of the chancel of the church, before the restoration was fully completed. 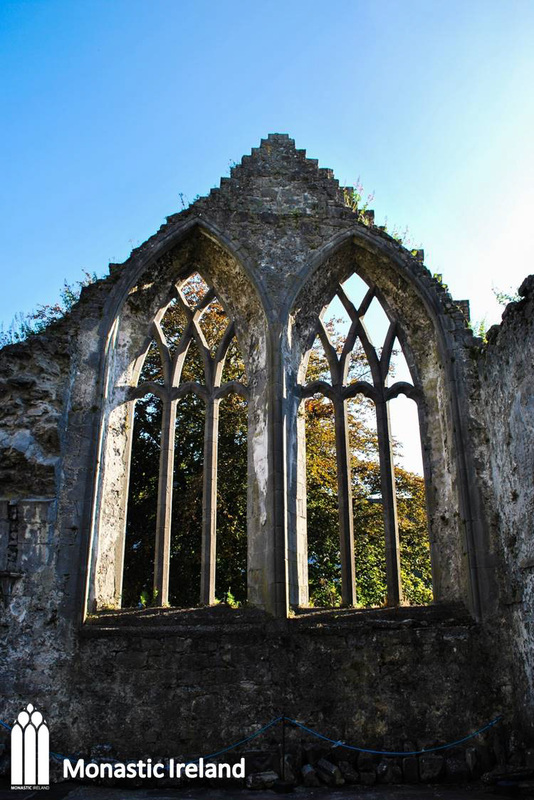 The chancel is the oldest part of the remains, dating to the middle of the thirteenth century when the friary was founded, as attested by its east window, a group of three tall pointed lancets framed by another two lancets. 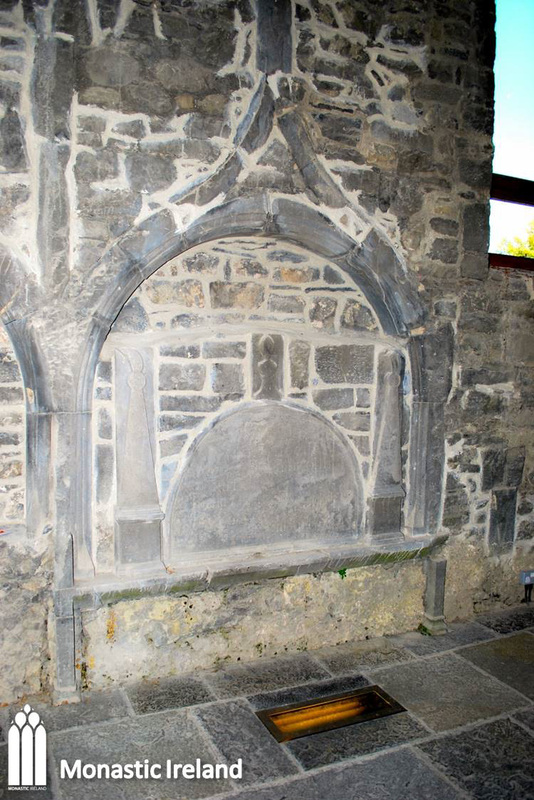 A view of the MacMahon/Creagh tomb before the restoration of the friary, when it was moved to the nave, while a replica was made to replace it in the chancel. 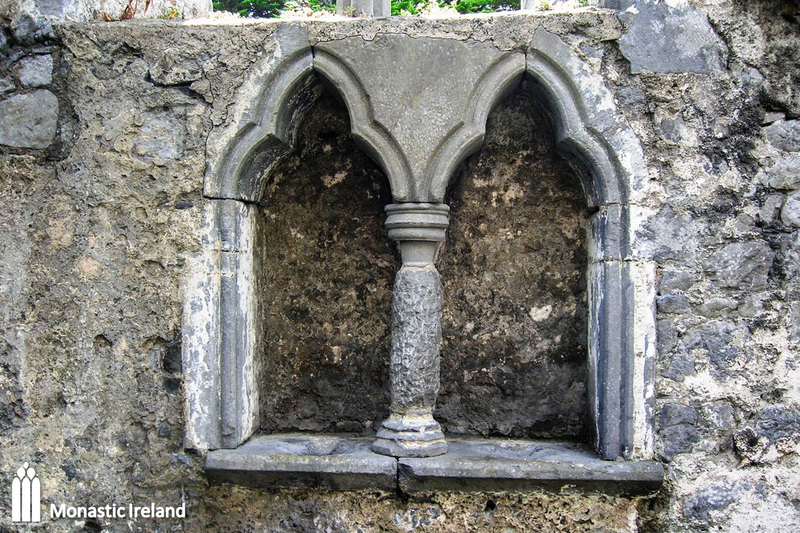 The tomb was originally commissioned around 1470 by Máire O’Brien as a resting place for her husband and for the MacMahon family. 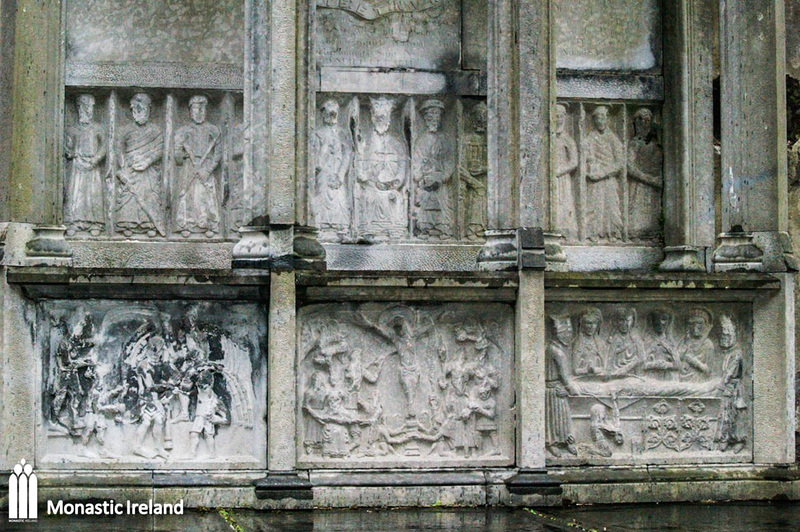 It was restored and incorporated into the Creagh tomb in 1843. The five panels at the base of the tomb narrate the scenes of the Passion of Christ, and the artistic style of the sculptures suggest it was produced by the same workshop, or even by the same artist, than the images of Francis and of the Man of Sorrows placed in the nave. The original tomb was restored and moved to the newly roofed nave for protection, and exhibition purposes. 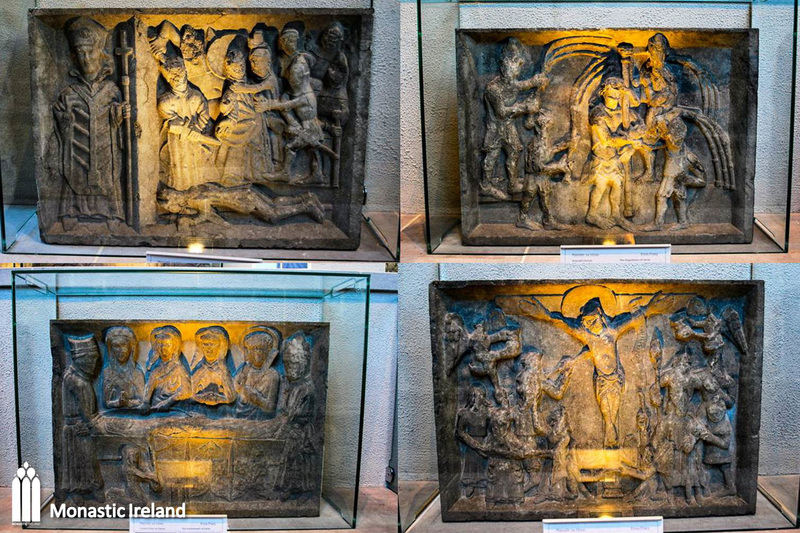 Each of the five panels placed around the base of the tomb is now individually presented and described in a glass case on the other side of the tomb: the Arrest of Christ, the Flagellation, the Crucifixion, the Entombment and the Resurrection. This sequence of images and the form of the tomb suggest that it was used as an Easter sepulchre, a representation of Christ’s tomb placed to the left of the main altar and where, during the Easter ceremonies, the crucifix and other sacred objects were deposited in commemoration of Christ's Entombment and Resurrection. A closer look at the first four panels of the tomb. From the top left, clockwise, we have a representation of the Arrest of Christ, which also shows an archbishop, his hand raised in benediction – this panel was originally placed on the left side of the tomb, facing west; the next three panels, which would have been placed on the front of the tomb, facing the high altar, represent the Flagellation of Christ, the Crucifixion, which was the central panel, and the Entombment of Christ. The final panel was placed on the right side of the tomb, facing east, and is a representation of the Resurrection of Christ. To the very right of the panel a woman is depicted holding a book, dressed in contemporary clothing, including an impressive headdress. This may be a depiction of the donor, Máire O’Brien, holding a Book of Hours, manifesting her personal devotion to Christ and the Passion. 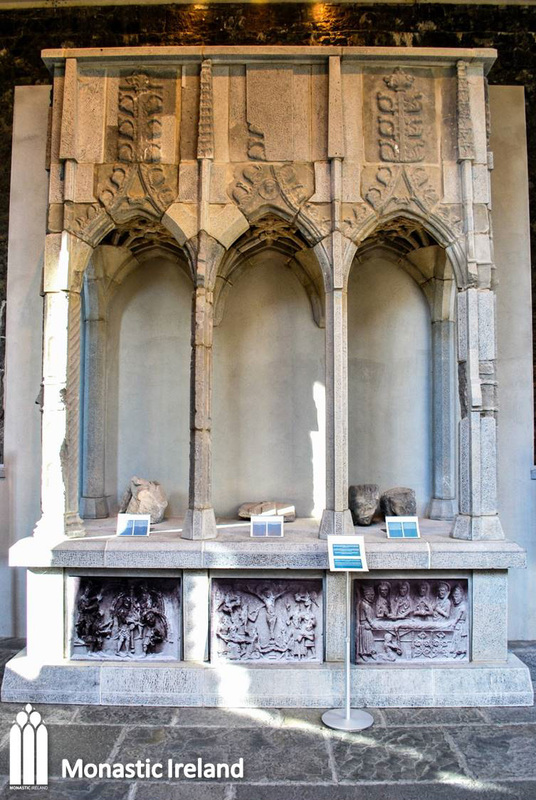 This thirteenth-century double piscine was located close to the high altar, in the south wall of the chancel. 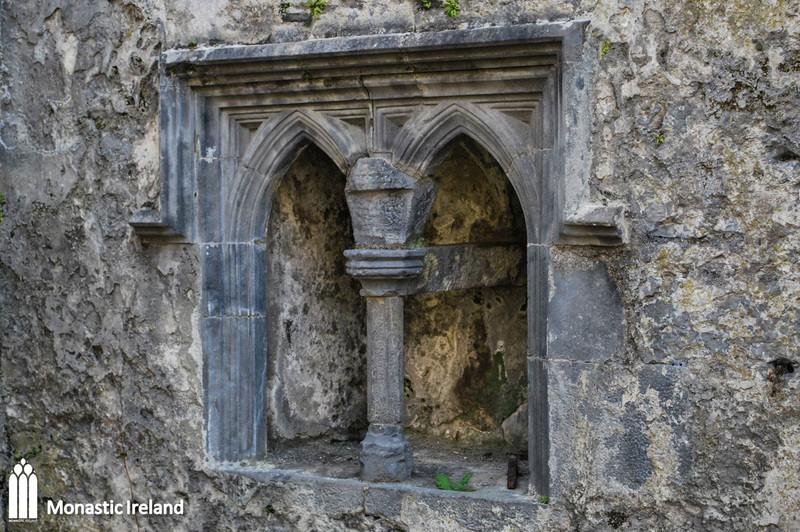 The basins were used for the disposal of the left-over contents of the chalice and other consecrated materials, the idea being that they soaked into the foundations of the church. A view of the exterior of the chancel, looking north, showing the row of thirteenth-century lancet windows that lit the space: three double-lancets and a triple lancet. The chapter house played an important role in monastic life. The community gathered here every morning to listen to a reading of a chapter of their rule, to pray for their benefactors, to receive instructions for their daily tasks and to deal with administrative matters. This is a view of the barrel-vaulted room located directly to the north of the chancel. I was likely used as the sacristy, although it has also been designated as the chapter house. 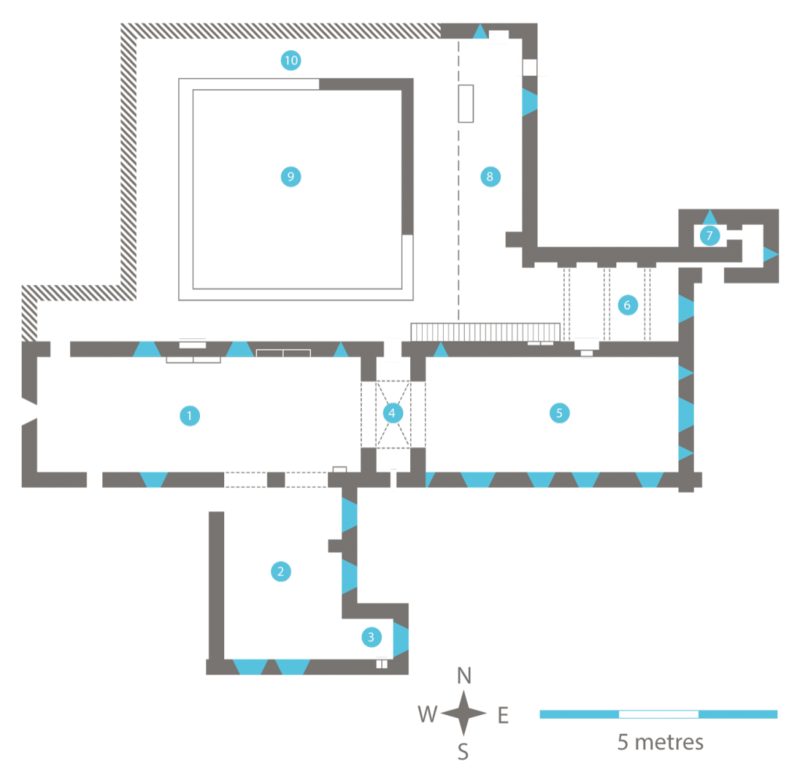 The space was possibly divided between the sacristy to the east and a chapter room to the west, though the latter could have also been located further north in the ground floor of the east range. A flight of straight stairs leads from the cloister walk into a large room above the Sacristy/Chapter room, the function of which has not been clearly determined. It could have been a library, or used as additional accommodation, perhaps for important guests, or as the guardian’s apartment. 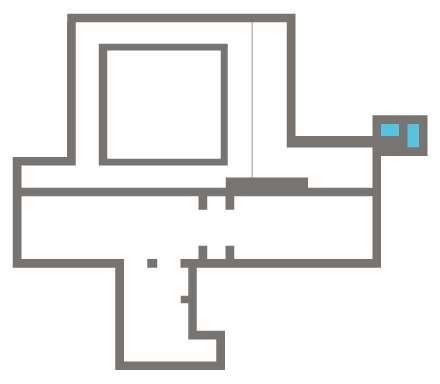 The function of the large room above the sacristy/Chapter room is not clear. It might have been used as a library, or as accommodation – it is also possible its use changed over the years. 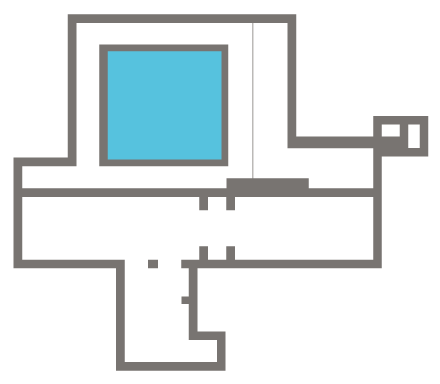 It was lit by a large pointed east window, replaced by a modern insertion, and it is connected to the northeast to a small room, located directly above the ‘prison’. 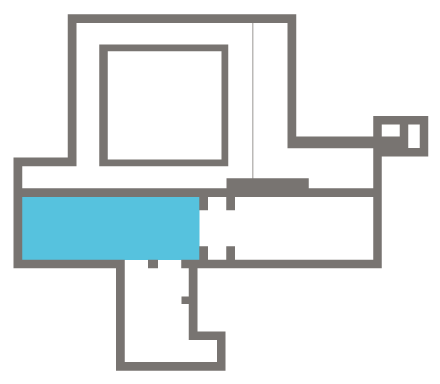 The garderobe, which is also known as a reredorter, was the communal lavatory usually situated at the northern end of the dormitory. 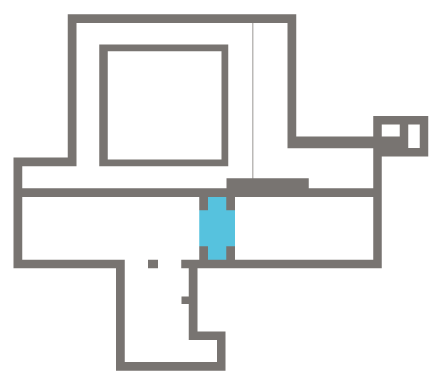 It consisted of a room with a long bench and a pit below into which the waste fell. 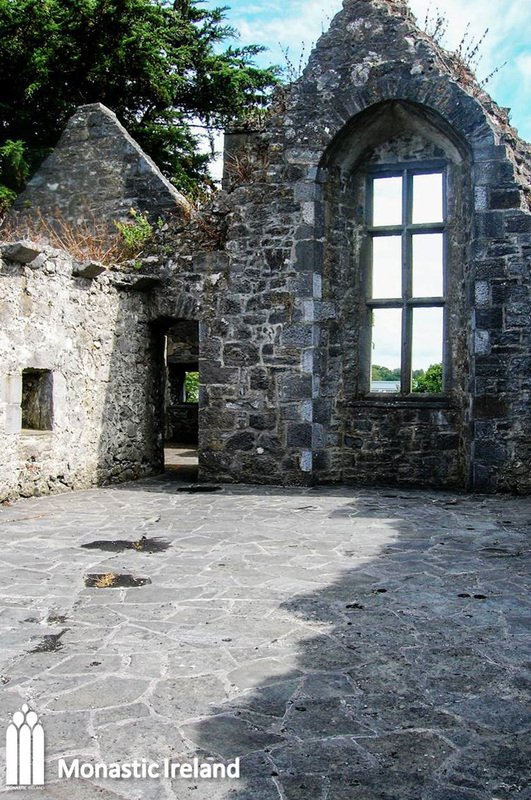 A view of the building extending to the northeast of the sacristy/chapter house, which housed on the ground floor a small ‘prison’ cell and a lavatory, and a small room in the upper floor connected to the apartment above the sacristy. 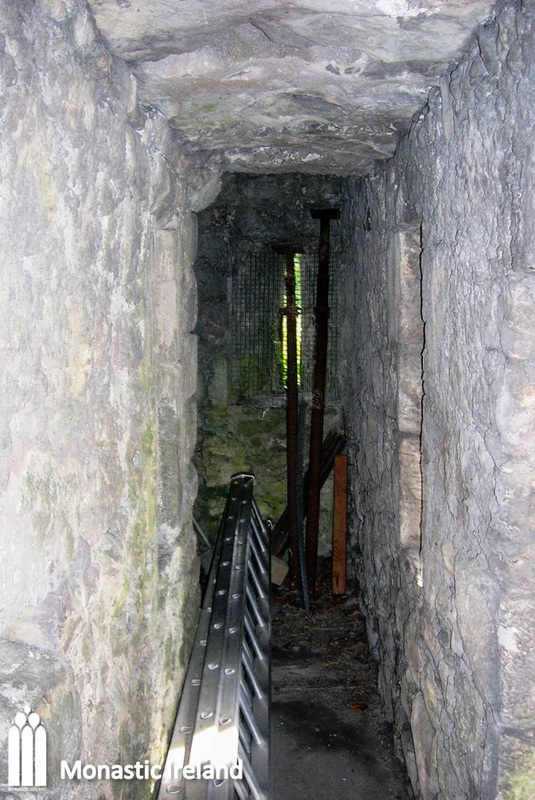 A view of the narrow corridor off the east wall of the sacristy, which leads into a little room which has been interpreted as a ‘prison’ cell, where friars who had faulted could be confined for a time. 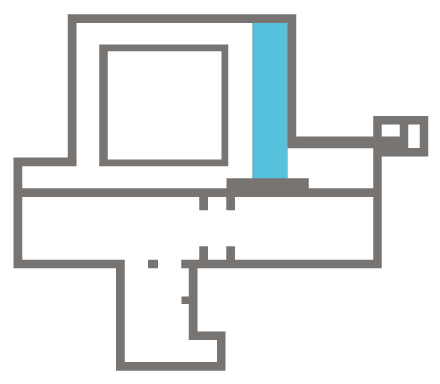 Just outside of the cell is a garderobe or lavatory, and inside is a small fireplace and a wall press. 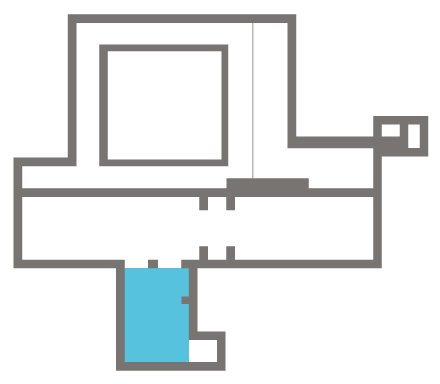 Directly above the cell and lavatory is a room connected to the apartment above the sacristy, accessed by a small doorway in the east wall of that room, pictured here. 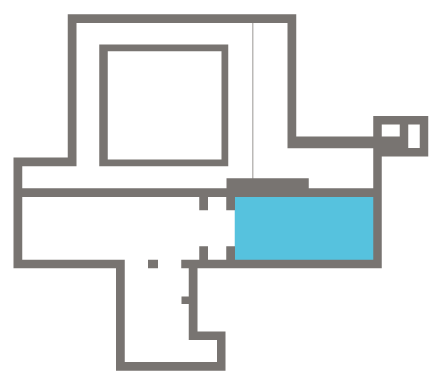 It is difficult, given what is left of the east range of the friary, to establish what are the functions of the rooms it housed, although based on the more extensive remains of other mendicant foundations, it is likely that as well as the chapter room – which might have been placed directly to the west of the sacristy, north of the chancel – it would have also contained a day room, where the friars assembled for a variety of activities, and of course a dormitory, in the upper floor of the range. 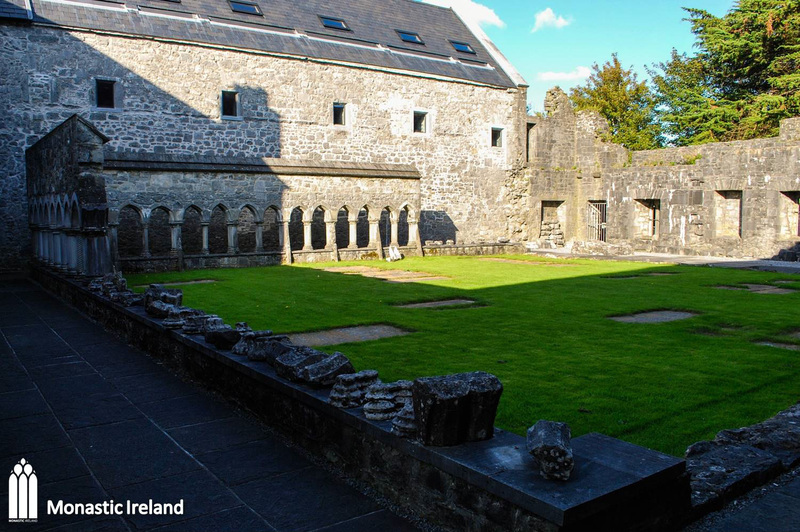 The cloister garth was the uncovered central space within a cloister. The cloister garth is surrounded by the cloister arcade and the cloister walk or alley. 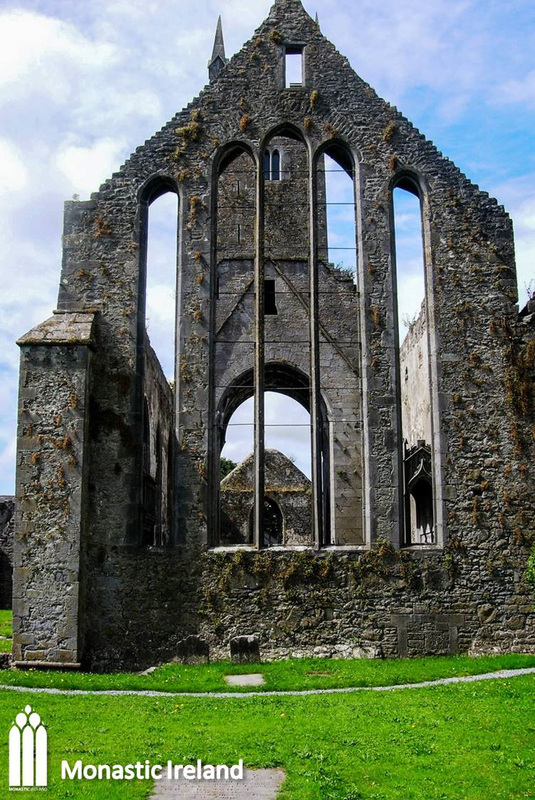 A view of the cloister garth of Ennis friary, which is amongst the largest of all surviving Franciscan friaries in Ireland, at around 14m in length. 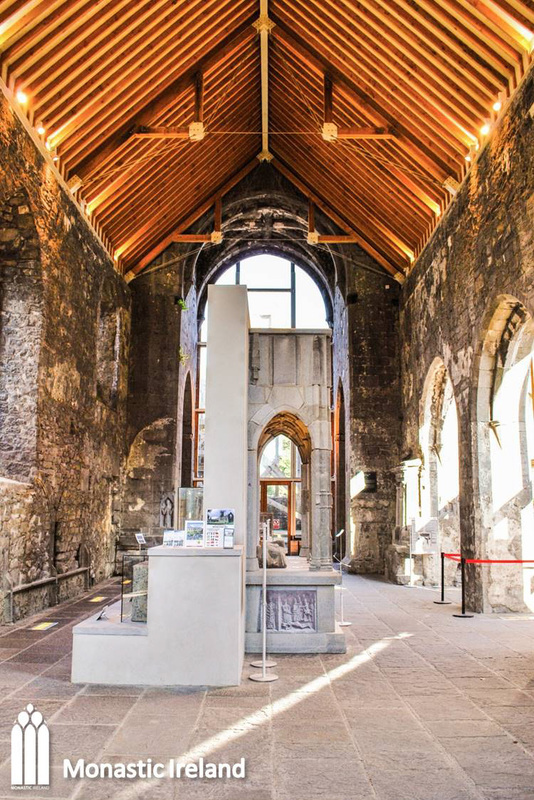 Part of the fifteenth-century cloister arcade surrounding the garth has been reconstructed. 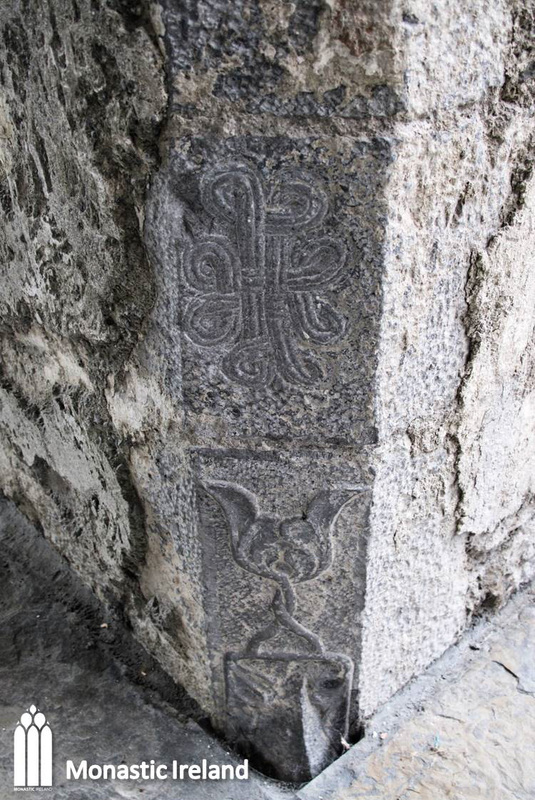 Two masons’ marks can be seen on the north arcade, one a clawed hammer on a capital and another a small leaf on a base. Another view of the cloister garth. 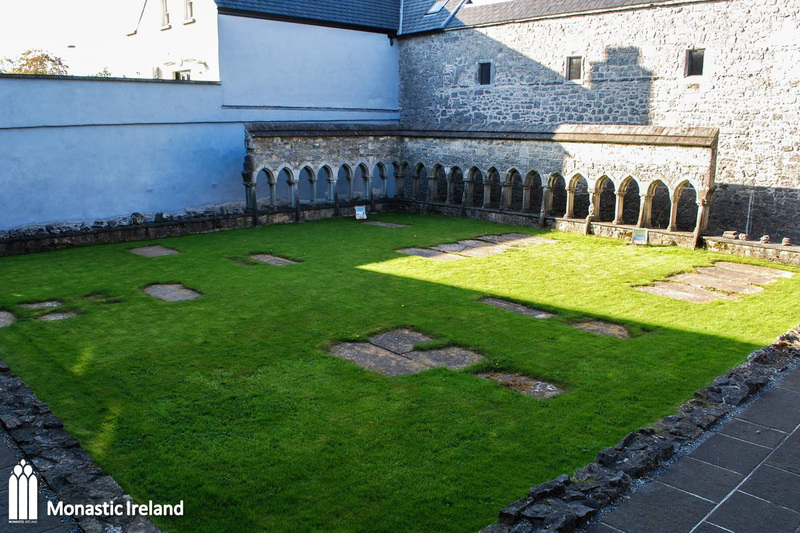 The wall behind the cloister arcade is medieval in date and is all that remains of the north range of the domestic buildings, where the refectory of the friars was likely located. Today a restaurant, ‘The Cloister’ has incorporated the wall as part of its premises, thus carrying on the age-old catering function of the building it replaces. 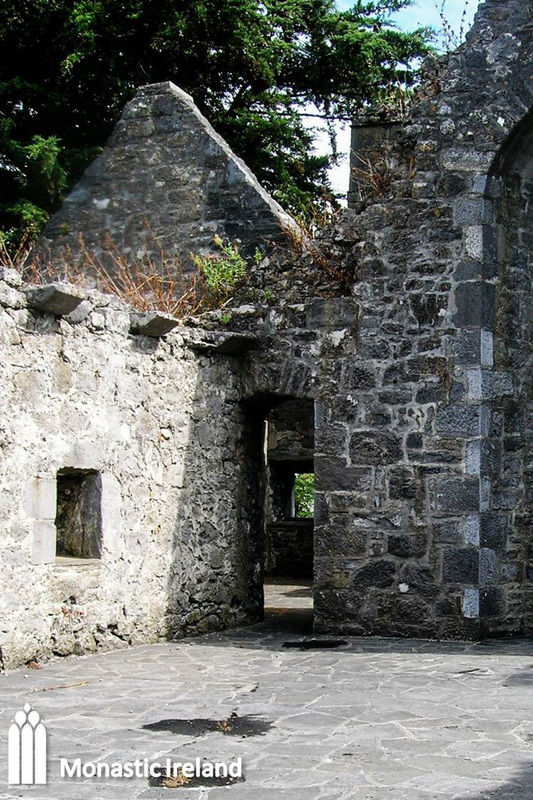 The cloister walk (or cloister alley) was the covered walkway that surrouded the cloister garth, connecting the domestic ranges to the church. 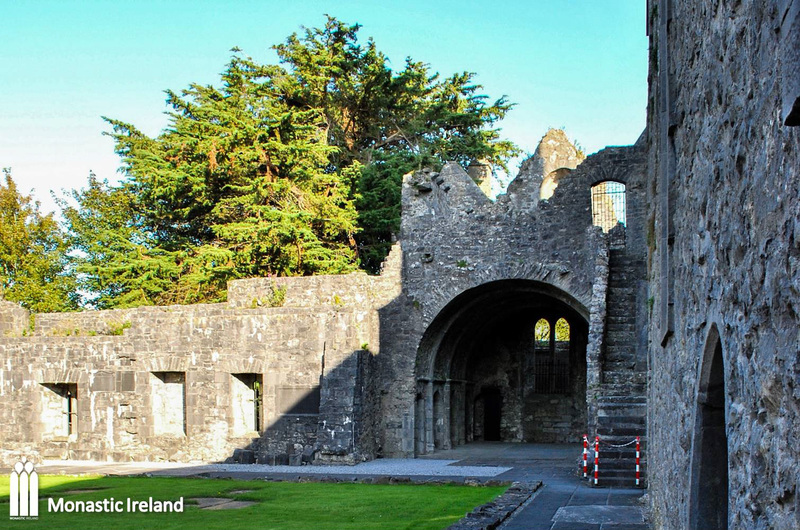 It was often used as a burial place for members of the order or for important benefactors. A view of the north side of the cloister walk surrounding the garth, which would have originally been covered by a lean-to roof supported by the cloister arcade. 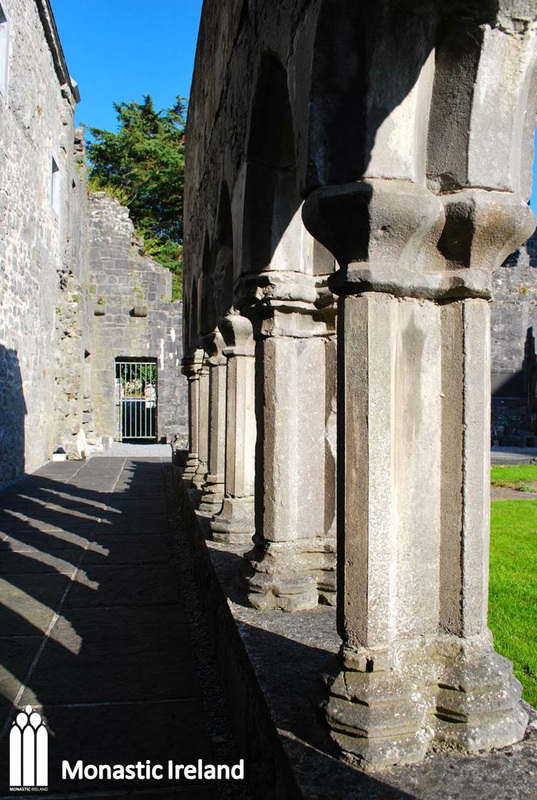 The arcade, which was reconstructed from fragments recovered around the site, is typical of fifteenth-century mendicant architecture, with polygonal ‘dumb-bell’ columns with moulded capitals and bases. 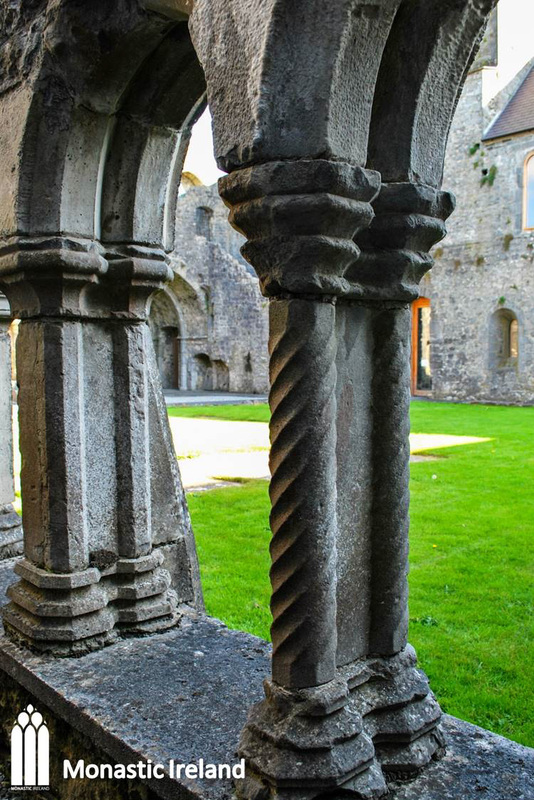 In addition to the polygonal dumb-bell columns, the cloister in Ennis also contains a few twisted or spiral columns such as this one. 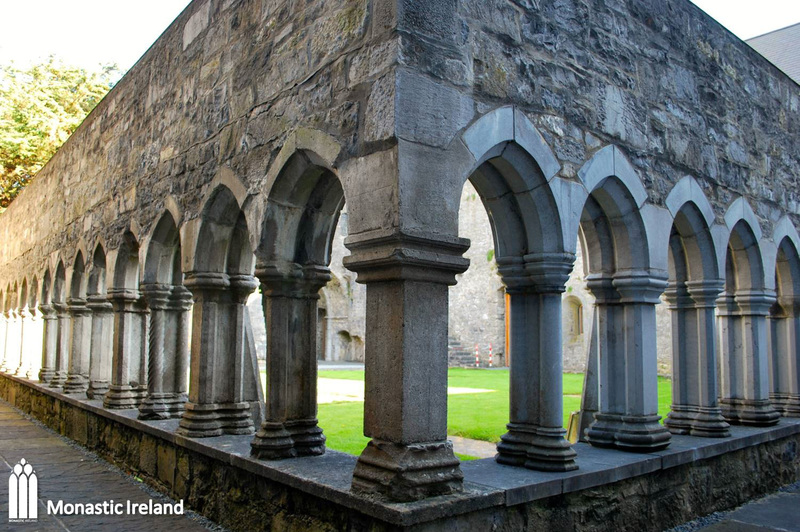 Similar columns can be found in the cloister arcade of Quin Franciscan friary, also in Co. Clare. Another view of the reconstructed cloister arcade. 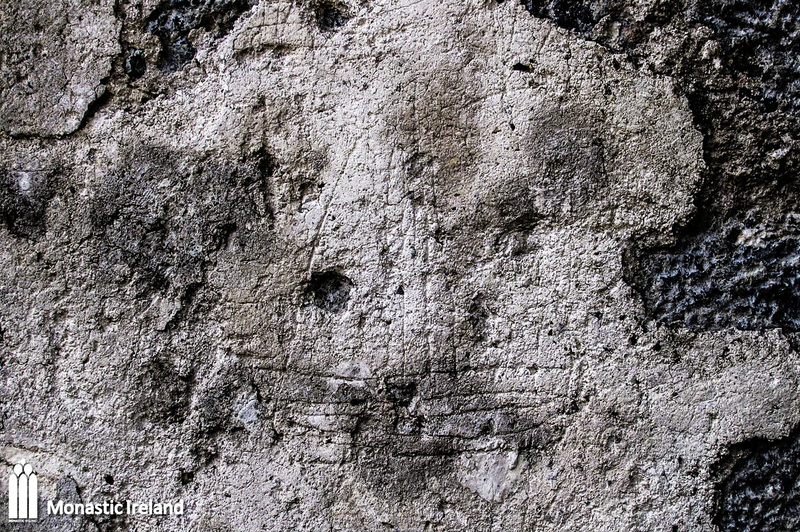 The medieval plaster at Ennis preserves a number of pieces of ‘graffiti’. Images of ships are relatively common, and appear to have been made by worshipers as ex votos, created when they were about to embark on a journey. This is a surviving fragment from a sculpture of a Pietá – the Virgin Mary cradling the dead Christ – a popular subject for devotional statues in the fifteenth and sixteenth centuries. It shows the torso of Christ his arm clutched by the hand of the Virgin, his body resting on her knees. 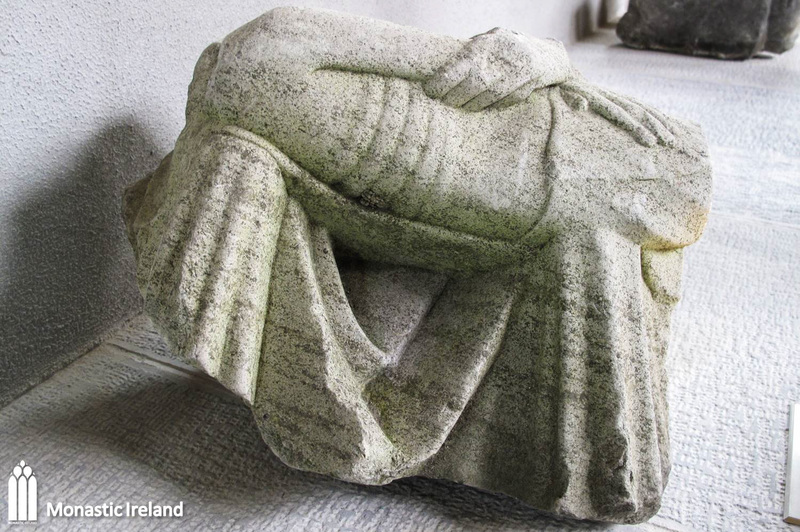 It seems to be the only surviving Irish example of a free standing Pietà. It is now displayed in the nave of the church, but it is difficult to suggest where it was originally placed, though it was likely located in the nave, so that the faithful could access it easily.